This morning I again awoke early and had a solitary breakfast, alone with Luci Tapahonso and the rhythms of Navajo speech that are so soothing. Again I read from Sáanii Dahataal The Women Are Singing . This morning the poem These Long Drives seems particularly appropriate. I will say my goodbye to Grants at last, and drive the back roads to Cuba. Today as I take my last quiet drive for a while and I will also lose the companionship of KTNN as I turn farther east. I could possibly reach Santa Fe or even Albuquerque today. That will be a shock to my system! I do not start out on I 40 this morning, but go on local streets through Milan, the little sister city to Grants, to find route 605 north toward Ambrosia Lake, one of the centers of uranium mining in the Grants Uranium Belt. The uranium in the Grants area was discovered by a Navajo named Martinez. The mines and mills found a ready source of cheap labor in the local Laguna, Ácoma and Navajo Indians, especially when the unions tried to organize the miners. The Indians were happy at first that there would be a source of local employment. Then the men would not be away so much of the time, as when they worked for the railroad. This also brought racism and discrimination closer to home but also led to a sharing of common experiences with workers from other parts of the country who had come there to work in the mines. The mining of uranium has taken a heavy toll on the Indian population in the Four Corners area. Not only did the Indians receive very little in the way of royalties for the extraction of the ore from their lands, but health and safety precautions in the mines were essentially non-existent. Mine operators and the U. S. government appealed to the patriotism of the local Indians to exempt them from conformance with labor laws. The miners wore no protective clothing and therefore carried the contaminated clothing home with them each day. They drank the water that seeped through the ore layers into the mines. The tailings piles were left in the open near the mouths of the mines to be blown over the land by the breeze. The radon (gas) released from these tailings was carried perhaps as far as the east coast by atmospheric currents. The tailings themselves were slowly washed down into the rivers and thus into the regional water supply. Large ponds of radioactive residues from the processing of the ore were created behind earthen dams with minimal regulation. One of these dams broke on July 16, 1979, at Church Rock, NM,1 with disasterous consequences for the Navajo population of this area. The volume of material released was so great that manhole covers were lifted in Gallup, NM, 20 miles downstream, much to the mystification of the local population. There had never before been a cloudburst with no cloud in sight. The legacy of the uranium mining is still being dealt with by the tribes in this area2, with little help from outside, and minimal compensation from the government. I drive past Ambrosia Lake, north to the junction at Whitehorse, and turn east toward Torreon and Cuba. A westward turn at Whitehorse would take me by, in about 10 miles, the long dirt road into Chaco Canyon. Approaching Torreon I drive along a riverbed between two sets of low bluffs. The riverbed foliage is dry, and the trees are very red along the banks. The road through Torreon crosses the river and twists through the town. I must be careful to get on the right road. KTNN is now lost in static. I travel in silence for a while. This is now the last lonely stretch of road before the main highway between Cuba and Farmington. Fortunately I do not stay on the road for very long, less than 5 miles till the turnoff to La Jara. I have been in the checkerboard region of Navajo country all day, but now I am entering the Hispanic/Pueblo part of New Mexico. The rest of the drive will be through small isolated Hispanic (and mainly Spanish speaking) towns in the northern highlands (though I will skirt the eastern edge of the Jicarilla Apache reservation. I leave the highway at La Jara and continue north through Regina, then turning east toward Gallina, Arroyo del Agua, Coyote, and Youngsville to the Abiquiu Reservoir on the Rio Chama. These towns are very small. From the road they appear to consist almost solely of a small combination store and bar which usually has a few trucks parked outside no matter what the time of day. After driving over the dam at the Abiquiu Reservoir, I reach US 84 in a few miles. My honeymoon is nearing an end, but I will do all in my power to forstall the imminent collision. I am now in the home territory of Georgia O'Keefe. 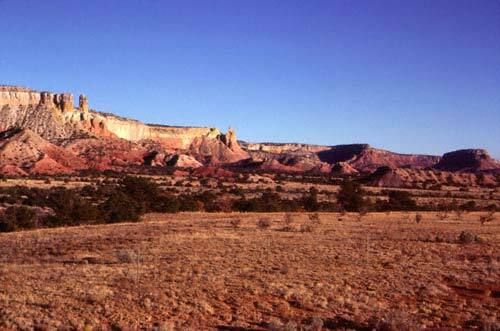 Just north of the intersection with US 84 is the famous Ghost Ranch where these cliffs tower over the valley. Just beyond Ghost Ranch is the road in to the Christ in the Desert monastery. South of the reservoir, the highway follows the Rio Chama into Abiquiu, where Georgia O'Keefe made her home from the time she left New York(19xx) until her death in (198x). Farther south along this river of life in this dry country, lie the small Hispanic towns of Chili, and Hernandez, made famous by Ansel Adams in his photograph, Moonrise, Hernandez . The scene has changed a little, but the same features remain. The highway is wider and busier now. There are more modern buildings. But the graveyard is still there in the foreground and the small town lies just beyond with the mountains in the background dwarfing everything. Even though it is still early afternoon, I cannot face entering a city today. I have a good excuse to put off this confrontation for one more day. Española lies just ahead and the Santa Clara Pueblo. I want to call one of the marvelous artists of Santa Clara, the sculptor, Nora Naranjo-Morse. I also need to do my laundry! As I drive through Española, I see a Comfort Inn with a laundromat across the street. Perfect! I pull in and register for the night. I have my laundry collected in a plastic laundry bag from the motel in Kayenta. After I check in and change out of the clothes that I am wearing so that I can wash those too, I walk across the street to the laundromat. Suddenly I am in the world of the Hispanics and Pueblo people. After all, most Anglos have their own washing machines. I get some change from the attendant and find an unused machine. After I put in my clothes, I have to buy some soap. I haven't done this for a while, so I hesitate at each step to be sure I get it right. One of the women (a pueblo woman?) helps me choose the package with the right amount of soap (there are 2 sizes of washing machines), and I thank her. I have brought a book to read, but I soon realize that that was a foolish plan. Children are running around and the visit to the laundromat is a social occasion for most of the people here. But it makes great watching and a great move into a different cultural setting. The few Anglos seem not to mix well. Maybe they're from out of town too. There are a couple of young Hispanic men here alone to do their laundry. They have no idea how much soap to add, though they have brought their own (or their wife's or mother's) boxes of detergent. One finally just pours some in. He has become embarrassed because he is in public. He looks aside at me as he closes the lid and sort of raises his eyebrows quizzically. In a few minutes soap bubbles begin coming out of the lid of his washing machine, and he runs back to it and sweeps the bubbles off the machine onto the floor. They quickly stop but he is very embarrassed now and looks sheepishly at me. He sees I am laughing with him and he grins widely. Soon I have to find a free dryer, but the women are very helpful. One says "I'm emptying mine now, you can have it." It's wonderful what just smiling and laughing with the people will do, even though I have not had a conversation with anyone. Or maybe they are this nice to anyone. But the other Anglos seemed very much to keep to themselves and never looked toward or smiled at anyone. When the dryer is done, I fold my clothes and stuff them in my laundry bag. I walk across the street to the motel and upstairs to my room. After sorting my clothes again, I lie on the bed and look in my wallet for Nora's phone number. I acquired the phone number in a funny way. We bought one of her scuptures. When the box arrived, (she had packed and sent it herself), a lot of varied paper had been used as packing material. One of the pieces that fell out was a credit card receipt for purchases made at a Chicago Cubs souvenir store in Chicago. As is usual now, the phone number was written on the receipt. I stuck that slip of paper in my wallet where it is now a permanent resident. I called Nora. We had a nice conversation in which she recalled our previous visit to her house and the conversation about astronomy that she had with us. She wants me to send her regards to Steve, who she remembers very fondly. After we hang up, I read for a while until it is time to eat dinner. There is a small Mexican restaurant next to the motel and I go there for some of the Mexican food that so distinctively belongs to northern New Mexico. It is good but not special. Back in the room, I read on the bed for a while before going to sleep. (I'll need my rest to make it back into city patterns tomorrow.) Tonight I read very special Luci Tapahonso poem, A Whispered Chant of Loneliness. Tomorrow I will visit the Puye Cliff Dwellings at the Santa Clara Pueblo for the first time and then go to Santa Fe to visit the Institute of American Indian Arts to see Roxanne Swentzel's sculpture Why? in the Alan Houser Sculpture Garden there. That sculpture has haunted me since I first saw it (as has her other work). Then I will go on to Albuquerque. 1 The nuclear testing conducted in Nevada also exacted a heavy price from the peoples of the Four Corners area, as well as those of Utah. Documentation of this cost can also be read in Wasserman and Solomon. A marvelous book, Refuge by Terry Tempest Williams, chronicling a year in the life of a downwind family, hers, heavily affected by this testing is highly recommended. 2 A recent book, If You Poison Us , by Peter Eichstaedt, from Red Crane Press, on the effect of uranium mining and the aftermath on Navajos is also recommended. 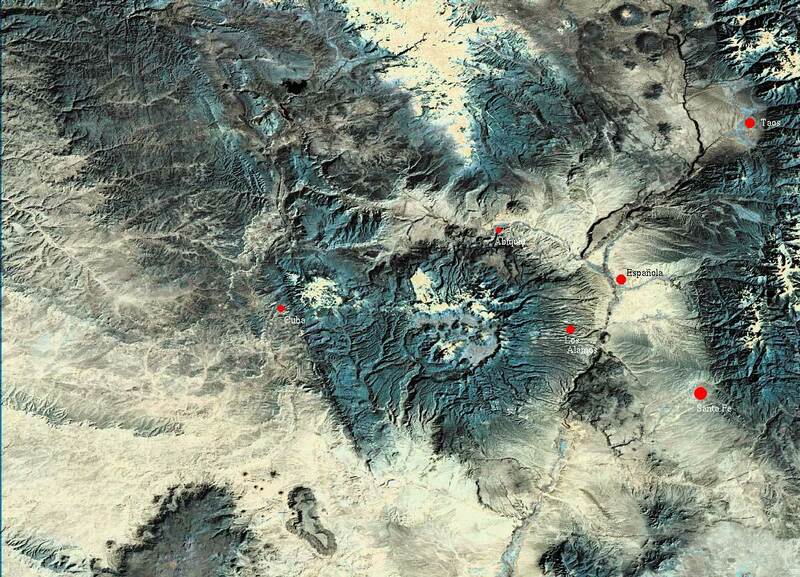 Navajo Uranium Miners Fight for Compensation by Timothy Benally, Sr.
A LandSat image of this region (~0.5 Mb), with places mentioned here marked, is also available. Kachina Tales From the Indian Pueblos , Gene Meany Hodge, Sunstone Press. The Pueblo , Alfonso Ortiz (San Juan Pueblo), Chelsea House. Alfonso Ortiz (San Juan Pueblo), Univ. Chicago Press. Songs of the Tewa , Harry Joseph Spinden, Northland. The People , Stephen Trimble, School of American Research Press. Pueblo Indians of North America , Edward P. Dozier, Waveland Press. If You Poison Us : Uranium and Native Americans , Peter H. Eichstaedt, Red Crane Books. Hiking Ruins Seldom Seen , Dave Wilson, Falcon, Pub. David Grant Noble, Northland Pub. Fran Kosik, George Hardeen, Creative Solutions Pub. Basin and Range , John McPhee, Noonday Press. The Colorado Plateau : A Geologic History , Donald L. Baars, Univ of New Mexico Press. Roadside Geology of New Mexico , Halka Chronic, Mountain Press. New Mexico Atlas & Gazetteer , DeLorme Publishing. Sherry Robinson, Univ. of New Mexico Press. The New Mexico Guide , Charles L. Cadieux, Fulcrum Publishing. Trading Post Guidebook , Patrick Eddington & Susan Makov, Northland Publishing. Creatures, Critters and Crawlers of the Southwest , April Kopp, Univ. of New Mexico Press. Storyteller , Leslie Marmon Silko, Arcade Books. Ceremony , Leslie Marmon Silko, Penguin USA. Almanac of the Dead , Leslie Marmon Silko, Penguin USA. Gardens in the Dunes , Leslie Marmon Silko, Simon & Schuster. Leslie Marmon Silko, Graywolf Press. Leslie Marmon Silko, Touchstone Books. Refuge : An Unnatural History of Family and Place , Terry Tempest Williams, Vintage Books. An Unspoken Hunger : Stories from the Field , Terry Tempest Williams, Vintage Books. Christopher Buckley, Vanderbilt University Press. Art of Clay , Lee M. Cohen, Clear Light. Fourteen Families in Pueblo Pottery , Rick Dillingham, Univ. of New Mexico Press. Pottery by American Indian Women, The Legacy of Generations , Susan Peterson, Abbeville Press. Pueblo Pottery Families: Acoma, Cochiti, Hopi, Isleta, Jemez, Laguna, Nambe, Picuris, Pojoaque, San Ildefonso, San Juan, Santa Clara, Santo Domingo) , Lillian Peaster, Schiffer Pub. Santa Clara Pottery Today , Betty Lefree , Univ. New Mexico Press. Talking With the Clay: The Art of Pueblo Pottery , Stephen Trimble, School of American Research Press. Portrait of an Artist : A Biography of Georgia O'Keeffe , Laurie Lisle, Washing Square Press. Georgia O'Keefffe : One Hundred Flowers , Georgia O'Keeffe & Nicholas Callaway, Knopf. Georgia O'Keeffe: American and Modern , Charles C. Eldredge, Yale University Press. Georgia O'Keeffe : A Portrait , Alfred Stieglitz, Harry N. Abrams. Georgia O'Keeffe at Ghost Ranch: A Photo-Essay , John Loengard, te Neues Pub. Co.
Georgia O'Keeffe : A Life , Roxana Robinson, University Press of New England. The Art & Life of Georgia O'Keeffe , Jan Garden Castro, Crown Pub. The Georgia O'Keeffe Museum , Peter H. Hassrick (Editor), Harry N. Abrams. Ansel Adams : The Southwest , Ansel Adams, Bullfinch Press. Ansel Adams and the American Landscape: A Biography , Jonathan Spaulding, University of California Press. The Portfolios of Ansel Adams , Ansel Adams, Little, Brown & Co.
Ansel Adams : The National Park Service Photographs , Ansel Adams, Artabras. Ansel Adams : Classic Images , James Alinder (Editor), New York Graphic Society. Ansel Adams in Color , Harry Callaghan (Editor), Little, Brown & Co.
America's Wilderness: The Photographs of Ansel Adams With the Writings of John Muir , Courage Books. Ansel Adams : A Biography , Mary Street Alinder, Henry Holt. The National Park Service Photographs (Tiny Folios) , Ansel Adams, Abbeville Press. Ansel Adams: The National Parks : A Postcard Folio Book , Ansel Adams, Little, Brown & Co.
Ansel Adams: Thirty Photographs : A Postcard Folio Book , Ansel Adams, Little, Brown & Co.
Find more books on the New Mexico Pueblos.